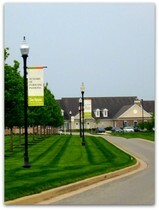 Britton Falls in Fishers is a 55 and older adult community that offers resort-like living year-round! Britton Falls homes give you a choice of Pulte Builders customizable floor plans ranging from 1197 - 2450 sq. feet. All of the homes are brick ranch- style with two to three bedrooms and an optional basement. With dozens of options ranging from brick color to bay windows to sunrooms, your Britton Falls home will be designed to your taste. In the middle of this community lies The Chateau amenity center. This beautiful facility features a fitness center, locker rooms, billiards, indoor lap pool, ceramics room, library with internet access, and three multi purpose rooms. Outside of The Chateau you will find another pool, three bocce ball courts, tennis courts, ponds, walking paths, and an outdoor patio area. The Chateau is also where you will find the full time Lifestyles Director who coordinates clubs, trips, hobby groups, and much more. You'll find the newest Britton Falls real estate listings below. For more information on these Fishers homes or any others, please contact us!